Today I attended the CrestCon and IISP congress. One of the keynote presentations was by Dr Ian Levy the technical director of the NCSC (National Cyber Security Centre). This was titled ‘NCSC – WTF’. It was a very interesting and refreshingly forthright talk, so I thought I would share it! He covered a lot of the work and plans of the NCSC along with some of his personal thoughts. My notes from the presentation are below, I have included various links for ease of reference, and definitely recommend reading the materials they lead to. Sets out government cyber policy for the next few years – read this! Should be single government / legal point of contact you got to for anything Cyber. 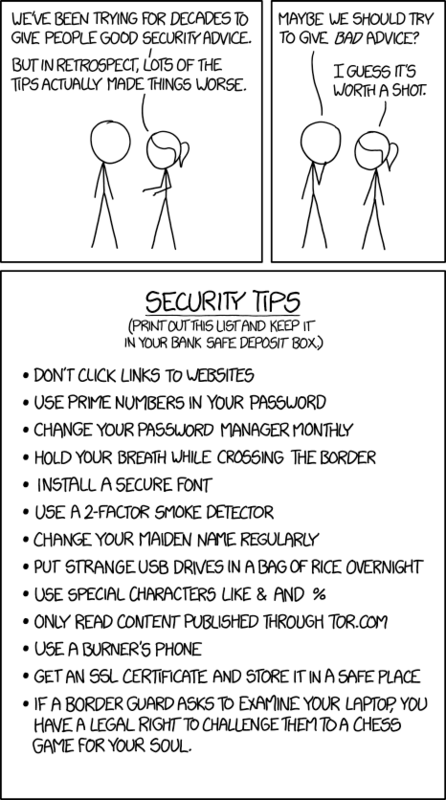 XKCD – Security tips cartoon! Highlighting that some security advice is not always the best..
Admins must not browse the web or use email with admin account – if you still allow this, you should get a new job..
Have a different, complex password for each system you use – stupid advice! (not)Awesome advice – Don’t open an attachment unless you trust the email.. – How do people ‘trust an email’??? If you own an email domain and don’t use DMARC you should be ashamed..
NCSC have open sourced their DMARC management solution – could we use this rather than paying for something? They even have a dashboard that will be open source soon. Recursive DNS is my friend. Great overview of understanding risk and uncertainty, but in context.. So you can target you security strategy and spending appropriately! E.g. 5 tips for email.. 5 tips for phones etc. something like – encrypt, keep up to date, use a pin, don’t jailbreak, only install apps from google play / apple store. Should be reserved for government, potentially not legal for private firms. Must be very organised, concerted effort. Attribution is very hard..
Any private company doing this is mad, due to potential repercussions. If you have any questions I’ll try to answer them, but I hope you have found this and the links interesting! Previous Previous post: Morals and economic issues of ‘seamless’ payments; some thoughts. Next Next post: Convenience and security.. when you loose a factor..